Amy Gillett Foundation chairman Mark Textor will be joined by 29 riders, including Tour de France stage winners Brad McGee and Phil Anderson and Commonwealth Games road race champion Rochelle Gilmore in spreading the message on cycling safety during the annual Amy’s Share the Road Tour. Rolling out from Cronulla in Sydney’s south on Monday 9 November, 30 riders will form two pelotons that will pedal their way through the scenic Southern Highlands and Snowy Mountains before finishing in Canberra, 850 km and over 10,000 vertical metres later, on Saturday 14 November. Amy’s Share the Road Tour is a key event on the Amy Gillett Foundation calendar, serving both as a major fundraiser and a great opportunity to raise awareness about bike rider safety. The name of the tour is derived from the Amy Gillett Foundation’s philosophy that we all need to share the road to achieve bike rider safety. Held annually, since the first Share the Road Tour in 2009, over $1.25 million has been raised by event participants, with the total raised during last year’s event surpassing $210,000. This enables the Amy Gillett Foundation to continue its work in delivering important safety messaging and a safe cycling environment. In 2015, the 7th edition of Amy’s Share the Road Tour participants tour like pros supported by team cars, mechanics, recovery massages, ride briefings and team dinners each day, whilst spreading the safety messages of the Amy Gillett Foundation with communities and schools along the route. Simon Gillett, Patron of the Amy Gillett Foundation, said Amy’s Share the Road Tour was a tangible way to spread the bike safety message whilst also raising important funds for the work of the foundation. “The Share the Road Tour will consolidate the Amy Gillett Foundations efforts in delivering road safety messaging throughout New South Wales via our It’s a two-way street campaign, which has entered its third phase and can be seen on billboards and street lightboxes across the state,” Mr Gillett said. “The arrival in Canberra celebrates the work of the ACT Government in introducing minimum overtaking distance legislation trial which commences on Sunday 1st November,” Mr Gillett said. The tour sees participants ride up to 185kms a day over the course of the week. Major towns that the tour will pass through include Wollongong, Kangaroo Valley, Cooma and Tumut. Stopovers in Fitzroy Falls, Huskisson, Braidwood, Cooma and Tumut will be combined with school visits by riders and by Mary Safe delivering her Remembering Amy for A Reason Program (details below). Day 1: Monday 9th November – Sydney to Fitzroy Falls, via Wollongong and Robertson – 136kms. Day 2: Tuesday 10th November – Fitzroy Falls to Huskisson, via Kangaroo Valley and Falls Creek – 112kms. What: Amy’s Share the Road Tour is a key event on the Amy Gillett Foundation calendar, serving both as a major fundraiser and a great opportunity to raise awareness about bike rider safety.The name of the tour is derived from the Amy Gillett Foundation’s philosophy that we all need to share the road to achieve bike rider safety. Held annually, since the first Share the Road Tour in 2009 over $1.25 million has been raised by event participants, enabling the Amy Gillett Foundation to continue its important work in delivering important safety messaging and a safe cycling environment. Who: 30 riders including weekend warriors who love to ride, former professionals like Brad McGee, Phil Anderson and Rochelle Gilmore, Orica-AIS rider Gracie Elvin and AGF Scholarship holder Kimberley Wells. AGF chairman Mark Textor will be joined by AGF Board members Rod Katz (on his first tour) and Matt Dimattina who has participated in every edition. 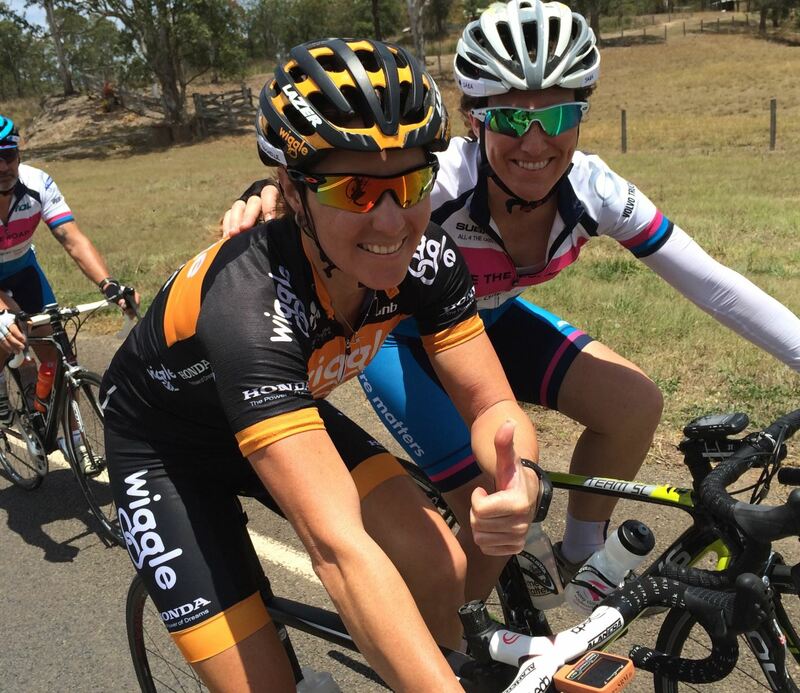 The 2015 Amy’s Share the Road Tour is proudly presented by the Amy Gillett Foundation and is supported by Toll, Subaru, Wiggle.com.au, Saxo Capital Markets, along with event suppliers Sub4, Europcar and High5 Sports Nutrition.